“Trailers”: you know, those movie previews we used to call “coming attractions.” A long time ago, movies like Casablanca or 2001 would feature the music we would later hear when, weeks later, we saw the actual film. Not these days (most of the time, anyway). Music for trailers has become a big and very specialized business, as I discovered when researching this story for Variety. I could have written a story twice as long and not covered all of the fascinating details of this relatively new industry. 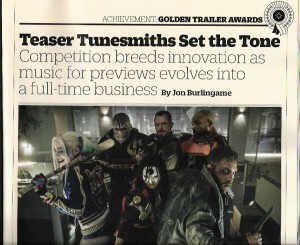 This entry was posted in Composers, Film Music, Interviews and tagged music for trailers, Pitch Hammer Music, The Hit House, Trailer Park, Trailers, Variety, Vibe Creative on May 4, 2016 by Jon Burlingame.